Gone are the days in our country when a former Solider could raise a Family of five on an 80 acre grain and livestock farm, but that’s exactly what Robert (Bob) C. Sullivan did after his service in WWII. Bob was a Soldier, a farmer, a husband, a father, a bus driver for the community school , and my grandfather. Bob was a common, hardworking, humble man. He never met a stranger and always had a smile on his face. Never in a rush – he always took the time to visit with his neighbors, friends and Family. I’m proud to say that Bob was a member of this Nation’s Greatest Generation, and he provided for his Family in the “Middle” or “Forgotten” rural farming community in the Midwest. In 1943 Bob left the hills and hollers of Greene County, Indiana answering the Nation’s call to defend the freedom our country enjoys today. He served with honor and courage as an 81mm Mortarman and Infantryman in Company H, 260th Infantry Regiment, 65th Infantry Division. The 65th was heavily involved in combat operations as Allied forces made the final push in Germany toward the end of the war. Bob’s unit spearheaded the attack into Central Europe and Rhineland – successfully defeating German forces. He earned the Combat Infantryman Badge and a Bronze Star for his service before being injured in a Jeep accident on the Autobahn, returning back home in 1946. Like many Soldiers returning from war, Bob hoped to someday start a Family and live the American dream. Two years later he married and their love endured for 56 years. Their children and grandkids serve as their legacy today. Bob was an extremely proud father. He placed his Family 1st and always helped out if called upon. He loved his Family, the farm and he loved to driver his school bus. 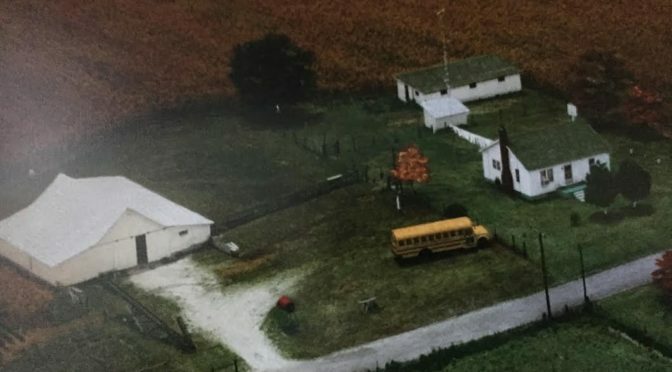 He was a successful farmer and drove the school bus for 45 years. Over 2,000 kids rode Bob’s bus. If you ever had the privilege of riding his bus – I guarantee you received good lessons in discipline and respect. You would be held accountable for your actions but he would earn your respect. Service in the Army and to our Nation is something unique I shared with my Grandpa Bob. Like many veterans, Grandpa Bob didn’t talk much about the combat he saw, only that he saw “enough (combat)” and further added “I don’t say too much about it, what happened and all that stuff. Some fellows won’t say anything.” Grandpa did share that his outfit joined the front at the Siegfried Line, then crossed the Rhine River into Germany, securing towns while searching house to house. He saw mountains and forest as we went up and down searching. A Jeep accident resulted in Bob being sent back to a hospital in Metz, France and eventually back to Southern Indiana where he lived the American dream- a good simple life.